Congratulations to Jacqueline Mathers, winner of our December 2010 monthly dollar card drawing! Jacqueline has been reading the Tarot for over 14 years, both in person and over the telephone for clients worldwide. Her honest and insightful readings are with the best intention that the querent will make positive changes that will bring prosperity and abundance in all matters of love, money and success. Jacqueline kept an e-mail advertisement from Dollar Card Marketing hidden in a desktop folder for over three years before realizing what a great way to offer a special on her readings. She now carries her “$20.00 for a 30 minute Reading” drop cards wherever she goes and they are a hit at corporate parties when she ‘decorates’ her table top with them and people come over to see if they are real! When Jacqueline is not reading for clients, she is involved with her career as an educator and has other small businesses that she has launched. 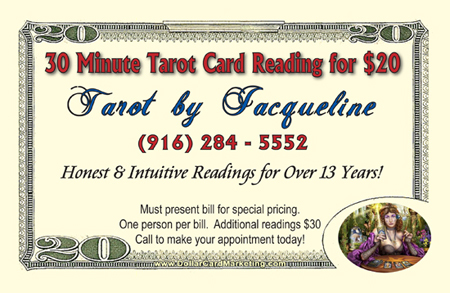 To reach Jacqueline, please go to her website at www.tarotbyjacqueline.com or call her at (916) 284 – 5552 (Pacific time). Email Signatures – Interactive, Customizable, and Awesome! Yes, we're still here and know we're behind!